It's a fairly simple job this week, but takes a lot of care and a lot of time. 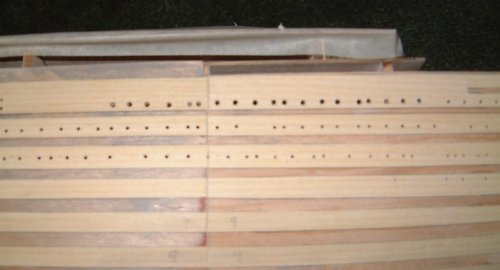 Drill all the portholes, getting the positions as accurate as you can. I used a hobby electric drill rather than the ceremonial drill that Hachette supplied. 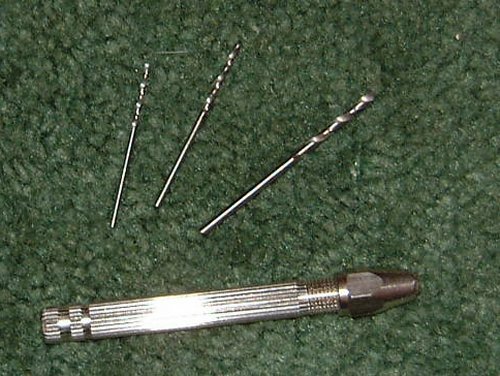 The drill bits are OK. When you've drilled all the holes, carefully peel off all the card patterns. I found that the best thing to use was a sharp modelling knife with a curved blade. Do it slowly and carefully, trying not to damage the planks underneath. The planks actually have a paper surface which you should be careful not to lift off. Don't worry if you do nick it here and there - a touch of filler, superglue and/or sandpaper will repair the damage. I lifted a couple of corners here and there. The instructions tell you to fill and sand the planks now, but I'm going to wait until week 31 which is when the last few bits of planking get fitted. A word about masking tape. You shouldn't leave it on the model for very long. The longer you leave it, the harder it sticks and the harder it is to get off without damaging the surface that it's stuck to. Three days is what is generally recommended, but a week or so is OK as long as you are not on a very delicate surface. If you expect to leave it there for more than a week, you can buy special masking tape from DIY stores. These are called 7 day masking tape or something similar. The glue is designed to last longer without sticking harder.